The must-see sites in this famous “City of Gold” are endless. The archaeological, religious, cultural, artistic and historical discoveries in Israel’s capital are enhanced by exotic sensory experiences and rare shopping opportunities. Both old and new sections of Jerusalem are packed with museums, archaeological sites, ethnic eateries and stunning views across the countryside. The streets host corner musicians playing to the crowds, public art exhibitions, and quaint shops selling original artwork, jewellery, antiques, ethnic clothing and religious objects. Many fashionable sidewalk cafes and restaurants offer fine dining under shaded awnings. Jewish history: shops, museums and alleyways of the Jewish Quarter, with the restored Hurva Synagogue, the Cardo, the Temple Institute, and of course the Western Wall and Tunnel (2000-year-old remains of the second Jewish Temple); the Shrine of the Book, where the world’s oldest Biblical scroll (at least 2000 years old) is on display; the City of David, King David’s tomb and Hezekiah’s Tunnel (dating back another 1000 years to first Temple times). Christian history: the Mount of Olives, the Garden of Gethsemane, the Church of All Nations, and a panoramic view of the Old City across the Kidron Valley; St. Stephen’s Gate (Lion’s Gate) and the Pool of Bethesda, the Church of St. Anne, the Via Dolorosa (passing the “Stations of the Cross” to the Church of the Holy Sepulcher); Mount Zion, the Church of St. Peter, the Room of the Last Supper and the Church of the Dormition; the Garden Tomb. 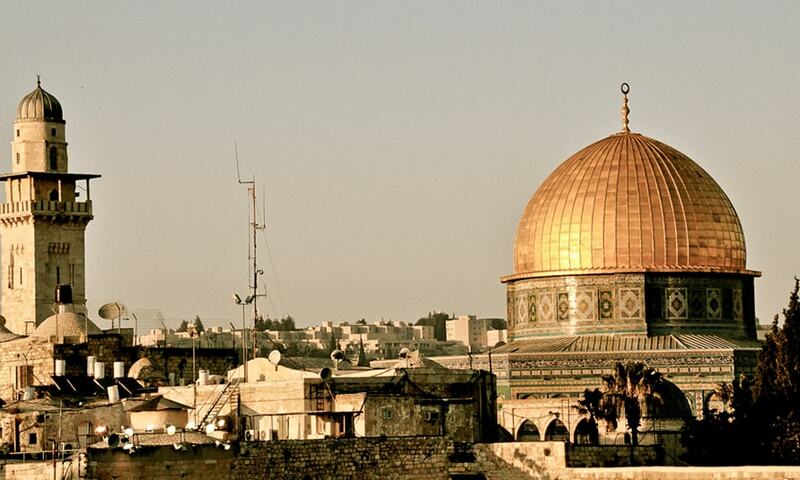 Muslim history: the Muslim Quarter and the Temple Mount, location of the Al-Aqsa Mosque and Dome of the Rock (structures of architectural beauty built in the 7th century).